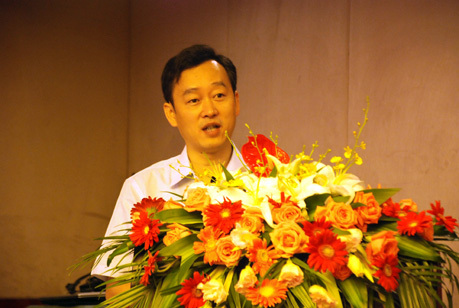 Shao Qing, deputy president of the Zhejiang Federation of Humanities and Social Sciences Circles. The federation is the academic organization and research center of East China’s Zhejiang Province in the fields of social sciences. Jiang Chengyong is the current president. The federation plays an important role in supporting scholars to conduct field investigations and theoretical studies. It has set up a healthy academic situation by exchanging with domestic and international institutes. Awarding outstanding scholars and supporting their research remains one of the federation’s guidelines. It publishes the monthly journal Zhejiang Social Sciences. The development of young scholars has become a focus of Chinese academia and society in recent years. In 2011, the Zhejiang Federation of Humanities and Social Sciences Circles launched Zhijiang Program for Young Scholars of the Social Sciences. To date, 15 research teams and 320 scholars have joined the program in three batches. The federation’s deputy chairman Shao Qing recently sat down with a CSST reporter and introduced the program in detail. CSST: The program encourages young scholars to keep pace with the times and develop the ability to solve problems by such methods as project research, academic exchanges and mentoring, thus contributing wisdom to the economic and social development of Zhejiang Province. Under what circumstances was the program initiated? Shao Qing: A group of senior and renowned scholars hoped that young scholars could shoulder the task of future academic studies. Our investigation showed that researchers below the age of 40 face huge pressures from family life, teaching duties and academic studies. Social science scholars often go through financial hardships in their career because currently more funding flows to the field of natural sciences. As a result, a backup platform seems perpetually out of reach. A handful of returned overseas students fail to thoroughly understand domestic or local issues even though they systematically learned Western theories, so a support mechanism is needed to help them make up for academic shortcomings. At this point, such a program is necessary to support young scholars to continuously make valuable achievements. CSST: What methods and explorations has the federation adopted since the introduction of the program? Shao Qing: The program’s goal is to gather young scholars and align the trajectories of their academic careers. Participants need to submit a five-year plan on their studies and strictly follow the schedule. After that, we help them by adding their plans to the Zhejiang Social Science Projects. The projects should be consistent with their research planning so scholars will not casually shift research fields with the sole intent of passing evaluations by the expert panel. Also, we organize one or two lectures each year by inviting relevant officials to give an overview of political and economic trends of Zhejiang Province as well as renowned scholars to share their stories of academic career. Through the lecturers, young scholars can have a better understanding of the current situation and improve their ability to connect theories with realities as well as gain an opportunity for scholarly exchanges with their counterparts from other fields and provinces. In addition, there are four to six academic salons each year in which the participants are divided into different groups by disciplines. Scholars can share experience of their studies around a particular theme, encouraging and inspiring each other in the brain storm. We also organize the Zhijiang Reading Forum for Young Scholars on the theme “classics and the present” each year. We advocate reading classic books from a perspective of Chinese realities. Each scholar reviews a classic book each year and applies its themes to contemporary issues. Domestic and foreign scholars with rich academic background are invited to guide these groups and hold lectures as well as revise research designs and academic theses. In terms of research funding, we used to give grants to scholars without any following-up investigation. These days, we spend the money in the aspects that I have mentioned to ensure the support mechanism. Meanwhile, we have made enormous efforts to integrate academic resources for participating scholars. For example, Zhejiang Social Sciences, an academic journal, has introduced one scholar in each periodical for several consecutive years, which greatly motivated the researchers. Above all, the program aims to create a sense of belonging. CSST: What progress has been made since the implementation of the program regarding the development of social science scholars and improvements to the economy and society? Shao Qing: In the past few years, a large number of excellent young social scientists in Zhejiang Province have joined the program, then lecturers or associate professors. Currently, most of them are professors and some of them have become department leaders, Yangtze River Scholars and Young Yangtze River Scholars. Zhejiang provincial government recognizes the outstanding achievements of social science studies every two years and 40 percent of prize winners of the recent two sessions are young scholars. Zhijiang scholars account for the majority of them, including the first prize that accounts for 15 percent of each session’s total 200 awards. Participants of the program have made an array of landmark achievements. The platform has been established to enable scholars to make greater academic progress. Nearly 40 percent of the participating scholars have gained the opportunity to work on projects at the national level. More importantly, an environment has been set up that enables social scientists to sharpen their academic focus on Chinese issues and the reforms and development in the province. Some experts on theoretical studies have begun to track practical problems. It is meaningful for the program to guide the shift of academic focus. We have emphasized that now is a golden time to propose new theories and ideas in the context of the huge economic and social transformation that China has undergone since the introduction of reform and opening up policies 40 years ago. Rational theories cannot depart from realities. Scholars have agreed that they will never come to the frontier if they interpret theories without keeping an eye on the present situation. CSST: What measures will the federation take to optimize the program? Shao Qing: Firstly, we are about to set up a Union of Zhijiang Scholars to perfect such priority plans as academic exchanges, salons and investigations and make them into well-organized regular events. At the same time, we hope young scholars can improve their ability to manage work and themselves. Also, we plan to open a variety of Research Centers for Zhejiang Provincial Development and establish research teams according to research interest and focus, which will gather young scholars to make collective efforts and shift their academic focus to meet the local and national demands. In addition, we need to optimize the evaluation and incentive mechanism. We used to encourage scholars to actively conduct scholarly investigations and interdisciplinary exchanges without any compulsory rules. We will continue to implement the advantages while making alterations. For example, a comprehensive institute is needed for the Research Centers for Zhejiang Provincial Development to evaluate academic results. Incentive mechanisms are also crucial to reward outstanding scholars and provide constant support to well-operated teams. CSST: What experience and lessons have been learned by implementing the program? Shao Qing: The launch of the program is only a start. Guiding it in the right direction is more important. Research funds should be used to boost research, and gradual growth is the ultimate goal. To be more specific, we hope young scholars can be inspired in academic training and pay more attention to practical problems. They will become more sensitive to problems and persistently find solutions. In this way, the program will motivate young scholars to improve their ability to conduct research and raise the quality of academic studies, thus making greater contributions to social development. This is the most important lesson that we have learned. The implementation of the program also offers valuable lessons. First, the work of management and organization can be a source of academic achievements. Academic studies and scholars require the support of organizations. A platform with an excellent management model can constantly innovate methods of research management and properly guide research objectives, which favors the growth of young scholars. The guidance of this kind may help returned overseas scholars propose creative sentiment instead of completely adopting the Western theories. We have found the right way to do so. Some participating scholars have changed their theories after conducting long-term field investigation. We should help young scholars when they are in need so that they can spend more time and energy on professional research rather than struggling to get by. Finally, proper guidance is required in the initial stage of their academic career, which will help them to achieve greater progress later on.